The last decade has seen a resurgence of interest in MS neuropathology.This resurgence was partly fueled by the development of new molecular and histochemical tools to examine the MS lesion microscopically, as well as technological advances in neuroimaging, which permit a dynamic assessment of lesion formation and disease progression. The heterogeneous pathology of MS in relation to stage of lesion activity, phase of disease, and clinical course is discussed. Pathological studies reveal that the immune factors associated with multiple different effector mechanisms contribute to the inflammation, demyelination, and tissue injury observed in MS lesions. While many agree that pathological heterogeneity exists in white matter demyelinated lesions, it is uncertain whether these observations are patient-dependent and reflect pathogenic heterogeneity or, alternatively, are stage-dependent with multiple mechanisms occurring sequentially within a given patient. Evidence supporting both concepts is presented. Remyelination is present in MS lesions; however, the factors contributing to the extent of repair and oligodendrocyte survival differ depending on the disease phase. A variable and patient-dependent extent of remyelination is observed in chronic MS cases and will likely need to be considered when designing future clinical trials aimed to promote CNS repair. 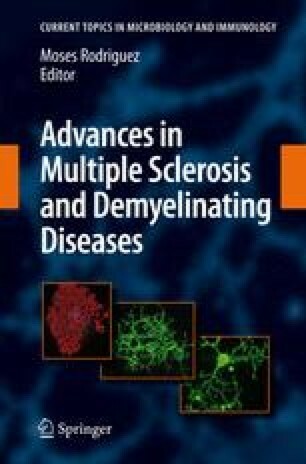 MS is one member of a spectrum of CNS idiopathic inflammatory demyelinating disorders that share the basic pathological hallmark of CNS inflammatory demyelination. Advances based on recent systematic clinicopathologic-serologic correlative approaches have led to novel insights with respect to the classification of these disorders, as well as a better understanding of the underlying pathogenic mechanisms.